Congenital X-Linked Retinoschisis(pronounced ret in OS ke sis and abbreviated CXLRS) is an early-onset hereditary retinal disease characterized by splitting (schisis) of the retinal layers, particularly in the center of vision (fovea) and/or in the peripheral retina. Estimates indicate that 1 in 5000 to 1 in 25,000 patients experience CXLRS depending on which population is studied. Vision loss is the most common symptom. CXLRS is typically diagnosed in males between the ages of 3 months and school age with symptoms that include crossed eyes (strabismus), abnormal eye movements (nystagmus) and “lazy eye” (amblyopia). When loss of vision is mild, it is often not detected until a child fails vision screening at school. 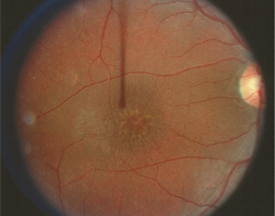 The exact cause of the retinal-splitting characteristic of CXLRS has yet to be established. Identification of at least 191 different mutations in the retinoschisin (RS1) gene—an adhesive protein—suggests that the condition occurs as a consequence of impaired cell-to-cell adhesion or bonding. Apart from heredity, there are no specific risk factors. CXLRS remains a clinical diagnosis. Affected males typically have characteristic foveal schisis (Figure 1). The peripheral retina also may be involved (Figure 2), with splitting of the retinal layers resulting in a blister-like elevation of the lower part of the retina. In severe cases retinal detachment may occur. CXLRS typically affects both eyes, although often not to the same degree. An electroretinogram (ERG) test, which evaluates the electrical “circuitry” properties of the retina, shows a typical finding in patients with CXLRS (selective reduction of the amplitude of the b-wave). Optical coherence topography (OCT)—a way of imaging the retinal structure— demonstrates the typical intraretinal cystic spaces (Figure 3). The trait is passed genetically to affected males by their mothers. Genetic testing is available and may prove helpful for women at risk of carrying the trait for RS. Female carriers usually cannot be identified clinically because they show no retinal findings and have normal ERG responses and OCTs. They are identified only through analysis of their family trees. Examination of male siblings and other maternal male relatives (maternal grandfather, maternal uncles, etc.) may be helpful. Genetic counseling is advisable for families in which CXLRS has affected male members. 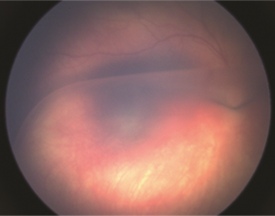 The foveal and peripheral retinal splitting that occurs in schisis cannot be treated, but secondary complications may require treatment. These include vitreous hemorrhage or bleeding into the gel that fills the back of the eye (4% – 40%) and retinal detachment (5%–22%). Blood filling the eye may impair vision to the degree that it needs to be removed to restore vision. The retinal detachments in CXLRS can be complicated, and are treated surgically as well. Crossed eyes (strabismus) and lazy eye (amblyopia) are treated by pediatric ophthalmologists. CXLRS is a lifelong disease. Vision is typically between 20/60 and 20/120 during teenage and middle-aged years. This level of vision can be improved with low-vision aids. Once stable, individuals with CXLRS are usually followed every 6-12 months with examination and imaging (OCT and color photography).